Every project starts with a max budget not to be surpassed–heads up–you probably will, but that’s another post. Budget – it’s a topic I bring up with my clients early for multiple reasons. To make sure they have realistic expectations. As I’ve said before, there is the “Budget” and then a “Realistic Budget”. Many times, the two are rather far apart, making clients either scale back their project or add a little extra cushion for that budget pushin’. As projects progress and money seems a continuous leak, clients tighten their wallets and focus on the prices of individual items rather than the overall budget. This is when people lose sight of “important elements” and skimp on quality or wants to ensure their budget covers the number of items it needs to purchase. What was once a MUST HAVE becomes a No because it’s just too expensive. This is when you refer back to your list of priorities…you know, the one you created in the beginning 😉. What are the most important elements in your design? This will give you an idea of the items you can splurge on (of course within your budget) and how to counterbalance those items by spending less on things that aren’t as important. Not a ticket to get on the regret train! Don’t cheat yourself by eliminating design elements because, at the moment, without thinking about your overall budget and other possibilities, the cost sounds too expensive. Don’t replace your $12,000 Calcatta marble (gorgeous!) 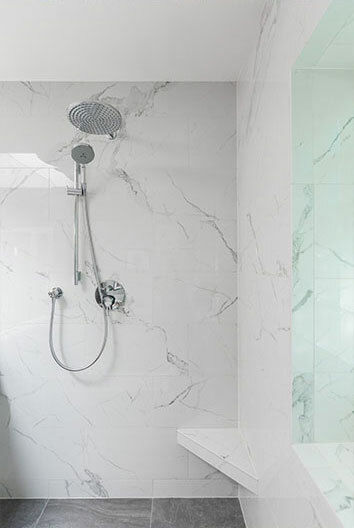 with cheap $3,000 porcelain tile (knockoff central) when your designer can find you $6,000 Carrara marble that is almost identical to the Calcatta you originally wanted! Allow yourself to think big and have your designer be the realistic bearer of bad news AND the problem solver. Also, don’t go bargain hunting sacrificing quality to feed your Amazon addiction. There can be a wide price range for one type of fixture because the type and quality of material differ. Cheaper material – cheaper product. In most cases that is OK, but when you go from a $1,900 tub filler to $175, there is a very good chance you will be replacing that tub filler AND your flooring in the not so distant future. In design, you get what you pay for. Are there overpriced items that don’t deserve the price tag? FOR SURE! That is why spending the time to identify your MUST HAVES, in the beginning, is essential. You can relax a bit knowing which items you are willing to spend more money on and how you are going to counteract that spending with items you are willing to spend less on. It’s not about creating your budget based on prices, but prioritizing the prices to fit your budget.